@ Flimper, if you're refering to the straightline performance, one reason is that that the new one has less torque. Seems the newer car is slower, maybe because it's heavier? This car should have 500ps I think. The hockenheim time should be 1.15.9 as well. Apparently the car was released as having 469hp but Mercedes found the engines actually produced 493hp so upped the figure. try evotech they can hook you up with 650hp maybe less for your "02 MB sl55"
He didnt exactly specify which GT3. but if were going to go that route, just put a 525bhp SL63 vs a 435bhp GT3 II, and its still going to be an interesting match to see a 380bhp GT3 vs a 493bhp Sl55, you also have to remember its all in the drivers, not just the cars. Anonymous, I think you have lost this argument. 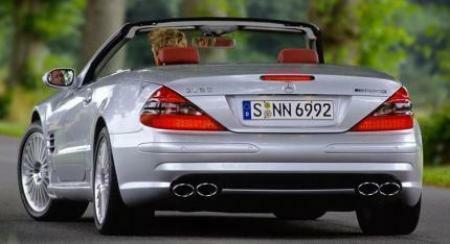 997 vs SL55 is not a fair comparison to begin with. 997 GT3 was introduced 4 years (!) after SL55. This guy says he has owned SL55 for 5 years which means those GT3 must have been against 996.
what are we talking about here?? tuned vs stock?? Im not talking about a 996 GT3, im talking about the 435bhp 997 911 GT3, that will even beat the SL63, but, a SL55 vs 996 GT3 would be an interesting match nontheless. That's E55 vs 997 GT3 RS. It's not hard to imagine SL55 vs 996 GT3. F360 Yes, but not a GT3, GT3 is 1000+lbs Lighter, and has a slightly better Cd, same with the F430, it wont beat them, power isnt everything, and its not nit-picking, its truth! It will beat GT3, Vanquish and F360 no doubt. And 493 hp ~ 500 hp car. Stop nit-picking. This has 493bhp, it will not beat a GT3 to 186mph, nor a 430, Vanquish, Maybe. even after is a guess. This is a 500 car stock. Of course it will beat GT3, Vanquish and V8 Ferraris in a high speed street race. I removed the limiter in the first year,apart from that it has clean filters,no mods atall.The supercharger pushes 11.5 lds (this equates to 10 litres normally aspirated) The car may be heavy but it is slippery.Alot of cars are quick up to 120 or 130mph but they simply dont have the shear grunt around 150 or more. Believe me the sl does,and in trouncing bucket loads. I suspect 95% of supercar owners don't have the guts to play at very high speeds.The sl has a very high top speed and it is still accelerating very hard at 150mph. There is plenty of evidence to support this all over the net. LOL to actually think you beat a GT3,Vanquish ans some Ferrari with this LOL and if you did no, this dont go no 200mph, so if your going to say that claim, say its not stock, then people could actually believe you. I have owned an sl55 for five years. The staggering performance only becomes apparent over 120mph. From here on up to 200mph its torque and not peak horsepwer that matters. 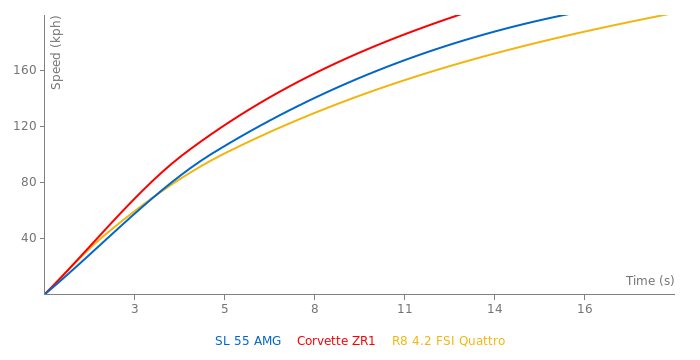 The sl wins out here because of the torque curve created by the supercharger. I have thrashed every supercar whose driver has had the guts to take it up in the 120-150's and over. Porsche GT3's, Vanquish s' ferraris, they simply wilt. They fade in the rear view mirror. 0-200 km acceleration , has it been changed it was almost 16 seconds plus , is it changed or whats goin on ???!!! I have a stock E55 and its limited i want to know the time if i open it , is it 50 second?? or less??? No thats for the SL65 AMG, in away its kinda hard to believe thiose numbers. but than again it does have all that power and torque, i didntthink it would beat a Carrera Gt to 186mph, but a test will always prove. Because CarGuy in the forum said that SL55 AMG from 0-300 in just 32.5 second & he said it's a proven numbers!! !